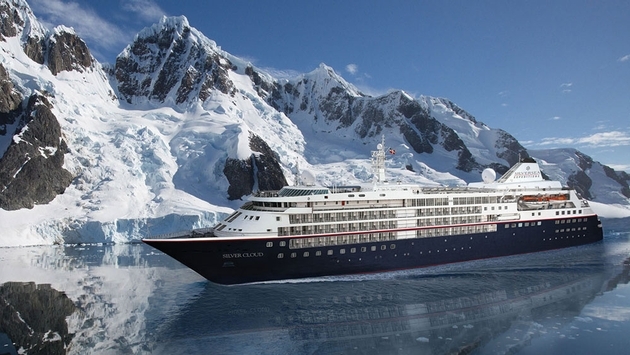 Currently sailing a 10-night Antarctic Peninsula expedition roundtrip from Ushuaia, guests are being treated to vistas of towering icebergs, snow-capped mountains and awe-inspiring wildlife aboard the completely refitted ship that includes the only Relais & Châteaux restaurant at sea. Silversea’s first crossover luxury expedition vessel can accommodate 254 guests, further limited to just 200 when cruising in polar waters. Most of her all-suite accommodations feature generous private verandas along with luxury touches that include a choice of European bath amenities, butler service for all guests, sumptuous Pratesi bedding and a nine-option pillow menu. Throughout, the reimagined Silver Cloud is positioned as the premier luxury expedition vessel. The brand-new Tor’s Observation Lounge offers commanding, 180-degree views of Antarctica along with relevant titles on the history of this beautiful but frozen land, while five dining options onboard offer up the finest cuisine in polar waters. Onboard and ashore, between 20 and 22 Expedition Team members conduct immersive destination experiences, aided by an onboard fleet of 16 zodiacs and 10 kayaks. These passionate and insightful professionals offer informative lectures, discussions and recaps in the ship’s two-story Explorer Lounge, in addition to guiding zodiac explorations of the coastline and leading hikes and nature walks on-shore—all of which are complimentary. Silver Cloud will offer 10-day roundtrip luxury expedition voyages to Antarctica through February, when she will embark on a thrilling journey from the southernmost tip of South America to the southernmost point of South Africa. From there, she will wind her way up the overlooked western coast of Africa to the natural beauty of Northern Europe and Arctic Svalbard. Her summers will be spent in the High Arctic, cruising in and out of the ice-filled bays and fjords of Iceland, Greenland and Arctic Canada in search of polar bears, whales and walruses. After an exciting mini-season spent in Central and South America, Silver Cloud returns to Antarctica again next fall for another series of expedition voyages to the White Continent. For further details on Silver Cloud expeditions, please visit silversea.com/ships/silver-cloud-expedition.html.